Have you heard of the dearly box? It's a jewelry subscription box run by Lauren, who also is behind Elisabeth Ashlie jewelry. I've often perused her site and love the simple, everyday pieces she has. 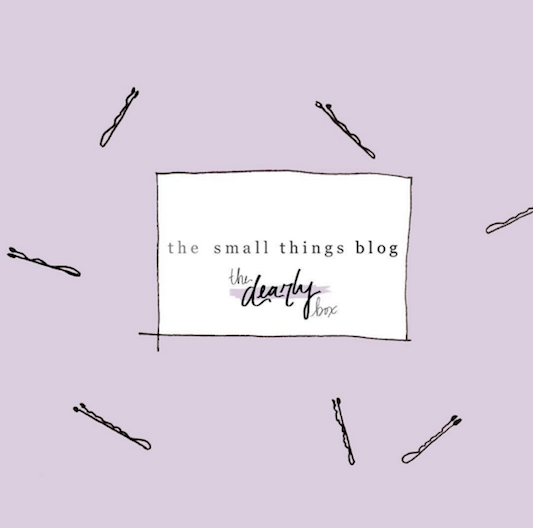 When I heard that Kate from The Small Things Blog (who also happens to be Lauren's sister) was curating an edition of the dearly box, I knew I needed to jump on that. I love Kate's style and love the jewelry from Elisabeth Ashlie, so it was a no-brainer! This time I opted to purchase just one box instead of committing to a monthly subscription. I love that you can choose whether you want the classic + casual box or the glam + chic box, because I'm definitely in a stage of life where I need classic + casual pieces. You can also select your metal preference (gold, silver, or blend); I chose gold. So let's get to the good stuff - here's what I got! Included in my box was a crossed bar necklace, three pairs of studs, and one pair of dainty teardrop earrings. I LOVED IT ALL. I'm pretty picky about everything (home decor, clothes, jewelry, you name it), so for me to have a box of surprise jewelry show up in my mailbox and actually like it is pretty impressive. I know I'm going to be grabbing these pieces all of the time. Especially that necklace! That is definitely my favorite of the bunch. The verdict: loved the pieces, loved getting a surprise box in the mail, and definitely think it was worth the money I paid. I can't wait to order my next one! This would be such a fun gift to give or receive, or just to treat yo self (duh). You can order yours here! disclosure: this post is not sponsored. I just love sharing about the things I find + love.